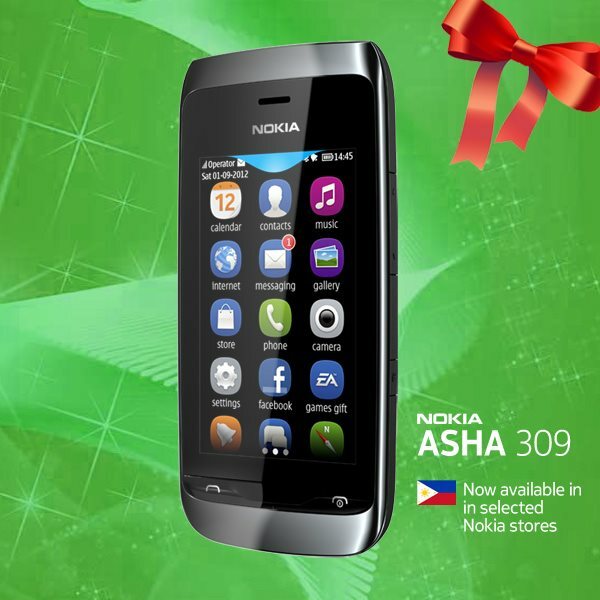 Nokia Philippines just announced that the Nokia Asha 309 is now available for purchase in the Philippines. The phones are the newest additions to the Asha Touch range and are Nokia's most affordable capacitive touchscreen devices to-date. The single SIM Nokia Asha 309 gives consumers a smarter Internet experience thanks to Nokia Xpress Browser, which enables up to 90% more efficient mobile browsing and faster access to rich web applications compared to conventional browsers. More about the Nokia Asha 309 specs and features after the jump. The new devices offer a fluid 'swipe' user interface and an open environment for third-party application development, characteristics that have earned the complete Asha Touch range full smartphone classification from global market research firm, GfK. The Nokia Asha 309 is a 2G-enabled device featuring a 3.0'' WQVGA capacitive display, multiple home screens, stereo radio, loud speakers and up to 32GB microSD card support. Boasting a great battery life, the Nokia Asha 309 comes in both Black and White. "Our innovative Asha Touch family of devices is designed for people who want a great smartphone with lower running costs," said Timo Toikkanen, executive vice president, Mobile Phones, Nokia. "By introducing the Nokia Asha 309, we're expanding our affordable smartphone lineup and bringing new mobile experiences to more people." Availability: Now available in selected Nokia Stores in the country. Note: Pricing and availability may vary in different Nokia stores. To know more about the Nokia Asha family you may visit www.nokia.com.ph. Sa phone po, maliit lng po ung file size ng games sa Nokia Asha.